Photos of sumptuous dishes are nearly as numerous as cat photos on social media. To sharpen people's focus on healthful eating, UC Cooperative Extension nutrition experts are using photos of food. 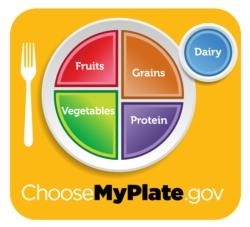 In 2011, the U.S. Department of Agriculture unveiled a new food graphic, MyPlate, to remind consumers to choose healthier foods. Work by Cooperative Extension in California that began years earlier influenced the adoption of MyPlate by USDA. 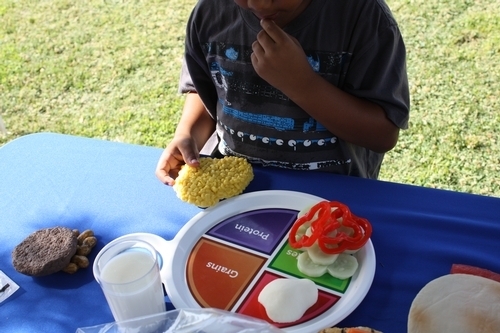 Nutrition educators in California began using a plate graphic with USDA's My Pyramid several years ago in a research project with Expanded Food and Nutrition Education Program (EFNEP) and UC CalFresh Nutrition Education Program participants. While evaluating the use of their graphic, which was very similar to USDA's MyPlate, UC Cooperative Extension nutrition advisors found that a graphic depiction such as the one USDA is using for MyPlate is abstract for many families. 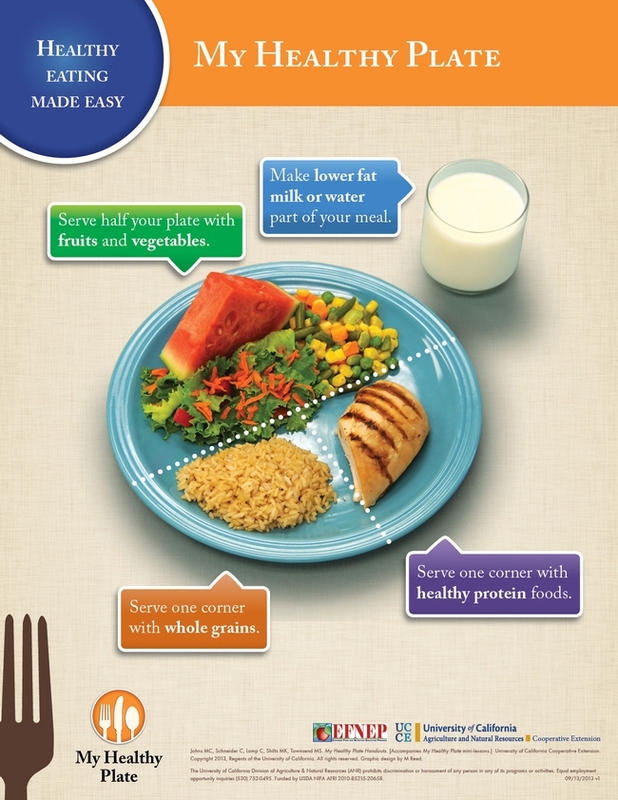 A child places food on the MyPlate template. In a project with more than 200 Latino consumers participating, the UCCE nutrition advisors learned which foods Latina, African American and other women would serve their families. Lamp and her colleagues developed materials with photographs of the preferred foods for nutrition education. They evaluated the behavior of consumers who were trained with the revised Plan, Shop, Save and Cook curriculum with photos of food and compared it with the results of the original version of the lessons. UCCE curriculum makes healthy eating easy. “We found that the group receiving the revised Plan, Shop, Save and Cook and MyPlate materials reported the greatest change in the frequency of using MyPlate to make food choices, after considering differences among groups in initial behaviors and participant characteristics,” Lamp said. 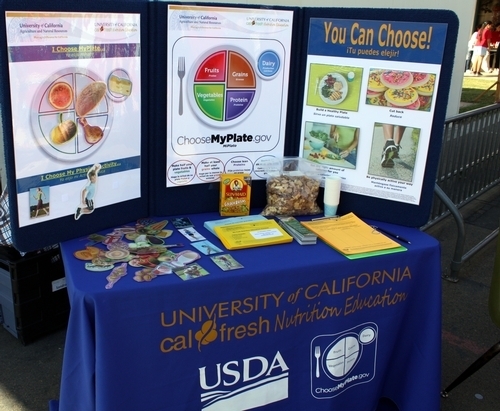 UC CalFresh shows examples of healthy foods on plates. Given the success of the photographs, UC Cooperative Extension created “My Healthy Plate” posters. Photographs of healthful food served on plates appear in all the EFNEP and UC CalFresh nutrition education materials, including the revised Plan, Shop, Save and Cook curriculum. To listen to an interview with Cathi Lamp about My Healthy Plate in Spanish, visit Enseñando a comer ‘con sabor latino' con MiPlato at http://ucanr.edu/sites/Spanish/Noticias/radio/?uid=5983&ds=199. I really thankful for your post.